The Big Lottery Fund’s investment of £82 million in 15 partnerships, that are working to reduce social isolation, could spark innovation and benefits beyond the 200,000 older people immediately involved in the programme. However, to achieve that I think the programme deserves more attention than it is getting, and the addition of an innovative approach to promote storytelling and learning. Currently, there are 10.8 million people aged 65 or over in the UK and this is expected to rise to 16 million over the next 20 years. Of those 10.8 million, 3.8 million live alone, and one million say they are always, or often feel, lonely. 17 per cent of older people have less than weekly contact with family, friends and neighbours. More people are now at risk of becoming isolated as the population of older people grows, lacking contact with family or friends, community involvement or access to services. The Big Lottery Fund aims to encourage changes and improvements so older people are happier, healthier and more active, contributing even more to their communities. That’s a major social issue, and as BIG says “partnerships in the fifteen areas will test what methods work and what don’t, so that evidence is available to influence services that help reduce isolation for older people in the future”. There are concerns about a ticking timebomb facing adult social care, but older people have a wealth of experience and skills to offer their communities. We need to tap into this – to help them help themselves and others living alone. Our Ageing Better investment will put them at the heart of the way the projects are designed and delivered to ensure that future generations of older people not only live longer but also live well. There’s lots happening in the partnership areas already, with many excellent ideas hinted at in the information so far released. That makes me feel there is plenty of scope to share stories day-to-day about local projects over the next five years of the programme, as well as undertaking the structured assessment planned by Ecorys. All partnerships are expected to put older people at the heart of their programme, both in guiding projects and acting as volunteers, and that provides a lot of opportunities for community and social reporting – which is, of course, one of my interests. However in this instance I would advocate that partnerships work with local social media enthusiasts to develop the necessary skills, and with people like my friend John Popham, whose blog details his work on digital storytelling and what others are doing in the field. I could list a dozen other people – like Shirley Ayres – who blend professional work with a personal commitment to sharing learning about social innovation using digital technology. I expect to meet quite a few at the Futuregov Expect Better event this week. Perhaps nationally Globalnet21 could help with some of their excellent webinars and events, as well, of course as organisations like Age UK and the Campaign to End Loneliness. The announcement of winners on September 8 received no significant coverage that I spotted – apart from making the lead in Tony Watts new Later Life Agenda newsletter. Tony’s OBE for voluntary work in the field is well deserved. Nothing in the Mail, and as far as I could see, little local coverage (I’m wrong on that – see update below). Nothing about the vision statements setting out the programmes in each area, that will now be developed into plans by the end of the year, and hopefully funded from next April. I think BIG deserves more credit for the meticulous way in which the programme has been developed – and the partnerships for their innovative proposals. Even more I think it is essential that there is some way for people involved in the programmes to tell the stories of what is being achieved – and the challenges they face – to maintain their enthusiasm and inspire others around the country, beyond the 15 partnerships. However, I wonder whether there may be a problem here for funders like BIG. They know the power of digital storytelling, use social media themselves, and increasingly fund projects enabling people to tell their own stories. They can issue press releases, and put out competitive contracts to promote programmes, and hook up with big media. All important – but not on their own enough to help foster the social ecoystem that releases the energy of local partnerships and people (who may not yet have the skills for storytelling) and also uses the amplifying capacity of people like John, Shirley, and Tony (to name a few … multiply that by scores). What’s needed is the national equivalent of the local approach being promoted by BIG: look at the existing communication assets and networks in the field – and not just the big organisations but the freelances and volunteers. Set out some comms objectives, and invite people to pitch ways and means to achieve them by training, support, content creating, publishing to a range of media. Bring people together to build the human networks that will create five years of buzz in the virtual ecosystem. A modest investment in facilitation would yields much higher returns on the £82 million. My suggestion would be to start this as soon as possible, so that partnerships can move from their competitive and secretive mode – imposed until now – into a more open and cooperative culture that will produce some cross fertilisation of ideas in plans now being prepared. That would also help carry partner organisations and volunteers through the flat spot between January and April when full funding is confirmed, based on December submissions. The obvious question is “how much would this animation cost” – but I don’t think it is the first thing to ask. That should be the same as the one partnerships are addressing locally: “how do we find out who is already doing good stuff in this field, and what would it take to encourage and support them to do more”. Disclaimer: these are personal ideas, and do not reflect those of others I have talked to in the programme or elsewhere. I’ve drawn on inspiration from similar explorations I’ve worked on, including one with John for BIG on People Powered Change. Update: I clearly wasn’t watching my Twitter feed as closely as I should in the week of September 8, when Hall Aitken – who are supporting partnerships – did great work in tweeting local coverage of the awards as it emerged. But there doesn’t seem to be any one place to find out details: the main Big Lottery Fund page about the programme has a latest news link, but it goes to a piece about Middlebrough, not the press release. Further update: link now fixed, to the press release. There’s a list of the partnerships with funding. The Old People Twitter account @BiglfOlderPeop provides updates. There’s now a Storify of the Twitter responses to the announcement. Provocation: instead of promoting an over-rich mix of technology to people who are resistant or not interested, offer a way to understand how the world is changing and then assess how little tech they might need for their needs and interests. 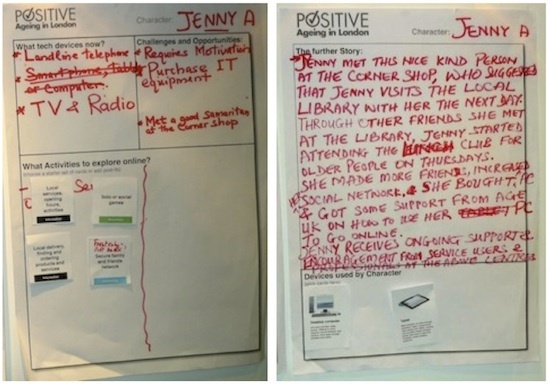 My immediate thought after our successful workshop on digital technology for older people was to develop a DIY version where people could profile the potential user, their needs and interests, offer a rich menu of sites, programmes and apps, then choose an appropriate device. This might be a smartphone, tablet, smart TV, desktop computer or laptop. Or – with the kit – they could do that for themselves using the a kit of cards and other resources, perhaps ending up with a hands-on demo if there were someone to help. … a lot of older people don’t see the need to get online, find the idea scary, computers intimidating and costly. Is it really so important – unless essential for communication with distant family, or accessing public information? If the latter, are there intermediaries who could help? Although I’m focussed here on older people, there’s an any-age issue too. I’m a technophile … but I’m increasingly uncomfortable with the idea of everyone must be online. so … reframe the problem. 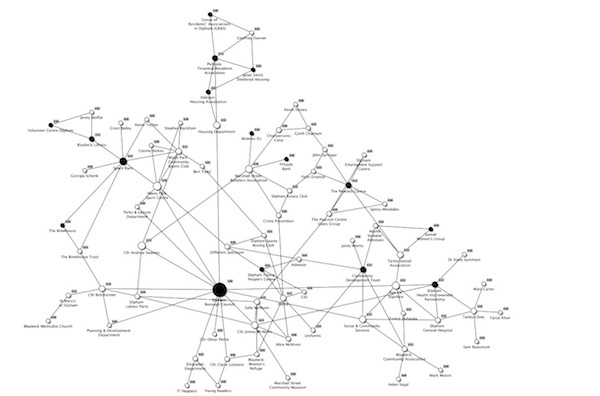 Instead of planning how we get more people into/onto the Internet (digital inclusion), accept many won’t go there, and think in more detail about the networks of information and relationships we each inhabit, served by lots of different media. 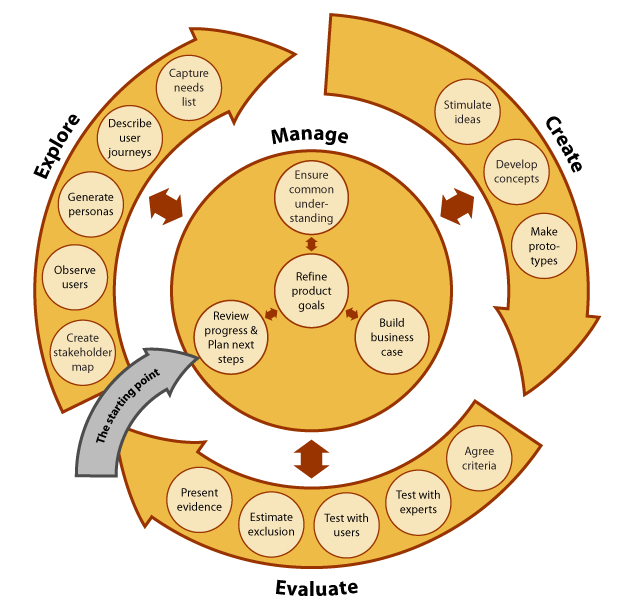 Then work through how to improve that experience in different cases (social inclusion). From that social ecology perspective, the challenge is how to help people build the blend of newspapers, magazines, phone calls, visits, relationships and maybe online activities that is right for them. The difficulty with the “choose your tech” kit is that it can make tech the solution without enough analysis of the problem. Tomorrow I’m making a small contribution to an online discussion among members of the Digital Inclusion Group of the Age Action Alliance, on the theme of what can we do in practice to move things forward. The temptation is to offer ideas on how we can do more to get more people online, and so “included” in the world of technology. But isn’t the real challenge how to help people create or expand the world they want, bringing in technology where appropriate? But how to help re-frame the discussion, and give us a nudge to change our minds about some aspects of the digital inclusion agenda? Here’s one idea I might fly. Let’s create a kit that helps individuals – or those supporting them – to profile their needs and interests, their networks, and the various ways that they communicate and get services. What’s working, and what isn’t. How interested are they in exploring new opportunities. Then how little technology might they need to make a difference, if any at all. If none at present, but the need arises, can someone act as an intermediary to get information, fill in a form, order something. If the minimal tech in insufficient, would it be easy to extend. I’m sure that there are lots of assessment methods from social care that we might build on. The exploration could be done within the Living Lab Drew Mackie and I are developing. The kit should include explanations of how the world is technology pervasive and dependant, so avoidance may be challenging … but the focus should be on helping people, friends, families and supporters, make choices about how they wish to live in that world. As technology become more personal, and the world more complex, the importance of understanding and being able reshape context become more not less important. So as well as looking at how to develop digital adoption and skills, look at building social ecologies. It might be not awesome, but it could be useful. With huge numbers of older people still not using the Internet, David Wilcox argues that it’s time for a rethink on the way we promote and enable digital inclusion. The recent Age UK London report on the Wealth of the Web did a really useful job of scoping the challenge of encouraging, persuading and supporting older people into using computers and so engaging with the online world. The report noted that 78% of Londoners aged over 75 are not online and a total of 661,000 people over the age of 55 in London have never used the internet – and then went on to recommend action by pretty much anyone who could help. These included government, voluntary organisations, private companies and older people themselves, acting as digital champions. Drew Mackie and I ran a workshop session at the launch event, where some 50 people played through how fictitious but realistic characters could follow their interests and enthusiasms using smartphones, tablets, smart TVs or games consoles as well as computers. Lots of buzz on the day, but since then I’ve been pondering how Age UK London – and anyone with similar concerns around the country – might move from research and discussion into large scale action. My hunch is that the game has changed, and try harder isn’t going to work. Here’s why. First of all, as the report showed, a lot of older people don’t see the need to get online, find the idea scary, computers intimidating and costly. Is it really so important – unless essential for communication with distant family, or accessing public information? If the latter, are there intermediaries who could help? Although I’m focussed here on older people, there’s an any-age issue too. I’m a technophile … but I’m increasingly uncomfortable with the idea of everyone must be online. Secondly it has, in the past, proven really difficult to co-ordinate large-scale action, by multiple agencies, on the lines set out in the report … not least because senior decision-makers in relevant organisations are frequently less than passionate about technology themselves. They know how tough it can be to make tech work, and can sense there won’t be easy wins. Thirdly, the report – and most programmes – are still focussed on computers, when a lot of consumer-led uptake is through smartphones and tablets. I suspect that older people with a potential interest in the online world are more likely to be enthused by a grandchild with an iPad than a computer in a community centre. So even if you could get all the agencies together to talk about a computer-based digital inclusion programme they would be on the wrong track. And if someone were to suggest (as I might) that they should focus instead on tablets and smartphones, I doubt if they would have the experience as organisations to move forward. Individuals within organisations might well be using tablets at home – but the organisations would generally not be mobile-literate. It’s good to see Age UK nationally promoting the uptake of tablets through a deal under which people can buy a customised Android-based Breezie Samsung tablet and get a year of phone support in the package. However, this still focusses on the technology (albeit more usable tech) and I suggest, additionally, a rethink on two fronts. … focus on these intermediaries. 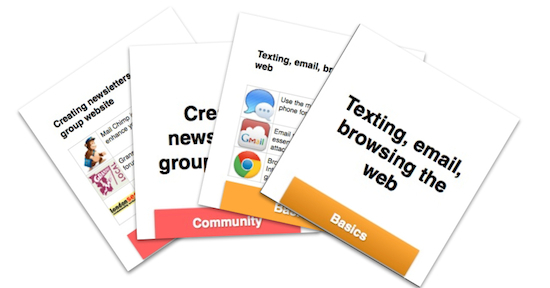 Help organisations and carers enhance their digital literacies in ways designed directly to help those they serve, often using mobile technologies. 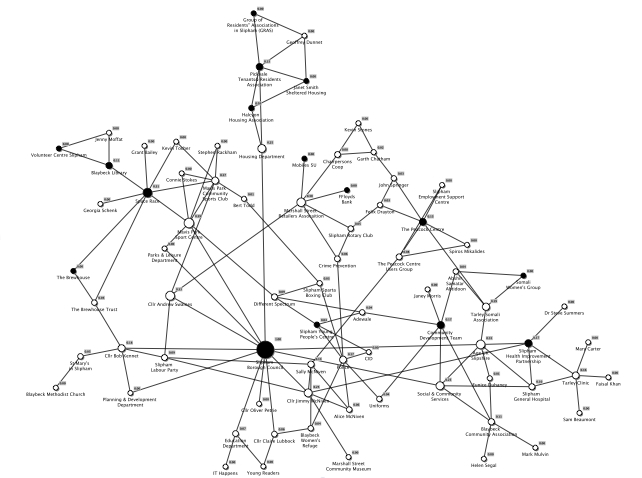 Map who connects with who in the networks, and use technology and other means to enhance those connections and relationships. Age UK London and Positive Ageing in London – and other regional organisations – are well placed to do that with the many organisations in the field … so start at home. Develop mobile digital literacy in key organisations, and build outwards. I would, however, go with the suggestion in the report about helping older people (or anyone for that matter) help each other. Recruit a core of volunteers who are enthusiastic about using iPads and other tablets like the Breezie and the Tesco Hudls, run some sessions to develop mentoring skills, and build a learning network so people can share experience. Ask organisations to host iPad/Android parties, building on the success of techy tea parties supported by EE, with bring-your-own tech. We could develop a DIY version of our workshop game so sessions don’t have to start with a screen, but with people’s interests. Of course there will be continuing demand for more traditional computer-based learning. Libraries and centres are invaluable in providing access, support and sociability. I just don’t think they are any longer the ground on which to mount a campaign. Summary: the impact of reports and campaigns urging digital adoption may be limited because people’s needs and interests are different. A game about online activities could provide insights into how to personalise. Your ideas welcome. 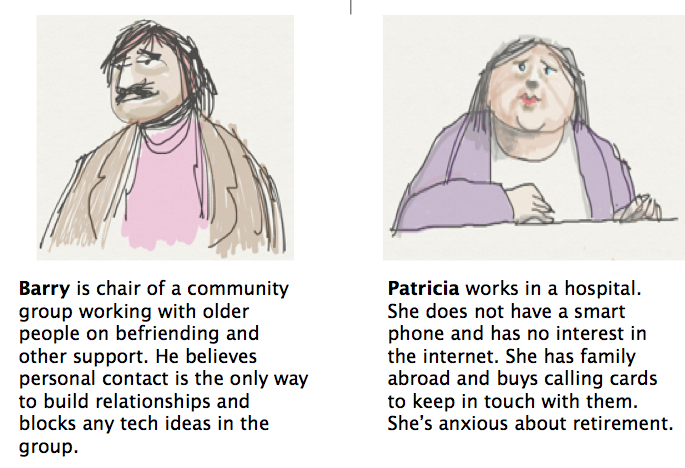 Last year I worked with colleagues on a report for Nominet Trust about how digital technology can help us lead a better life as we get older. It was well received, but not much help if you are sitting down with someone wanting to show them practically that it may be worth them touching a keypad or screen for the first time. Nor is it much help, in my experience, to tell people tech is a Good Thing, or the Government wants to save money by putting services online and they are Going To Have To Go On or Miss Out. Digital Inclusion and Engagement is a turn-off to most people who are unconnected … or who may actually be online but don’t use their Smartphone, Smart TV or games console like the computer that it is. But the Internet is important because it is re-shaping our world, and may help at the personal level in combating loneliness, managing finances, getting goods delivered, dealing with health issues and so. That’s as well as the fun stuff. You don’t need a report to prove it. Just look at the newspaper inserts detailing 500 must-have apps for phones and tablets, under those headings. The Telegraph has just published two such guides. The problem is that everyone is different. The must-have activity and app for one person may be irrelevant to another. People who learned touch typing may like a keyboard, others a touch screen. If you have figured how to Skype your family on your Smart TV, hitting the Facebook app there is going to be more appealing than learning a new device. While there may be some basic skills that are going to be important for everyone in future, learning how to switch on a computer and use a web browser isn’t necessarily the place to start for many people. If you are personally fairly familiar with the possibilities, you can probably find out someone’s interests and capabilities and take them through what’s possible on, say, an iPad or the much cheaper Tesco Hudl. But if you are designing a campaign to make a difference to a lot of people, how can you think both about scale and about personalisation? 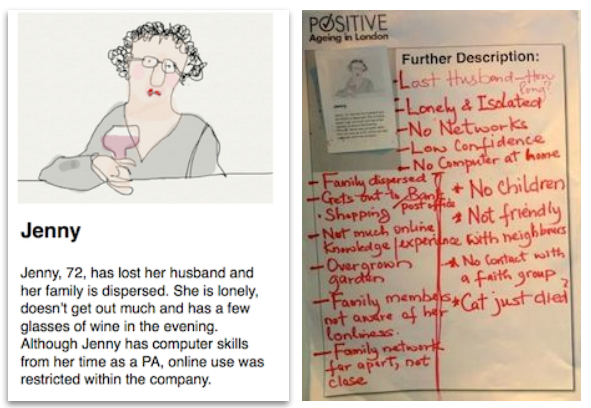 Positive Ageing in London (PAIL) and Age UK London have given Drew Mackie and I a chance to try a different approach on January 27 when they launch a report on digital inclusion. Before the policy makers engage with the comprehensive overview report prepared by Ben Donovan we are going to run a workshop game with PAIL and a few dozen people – a few of them experienced online and others not. 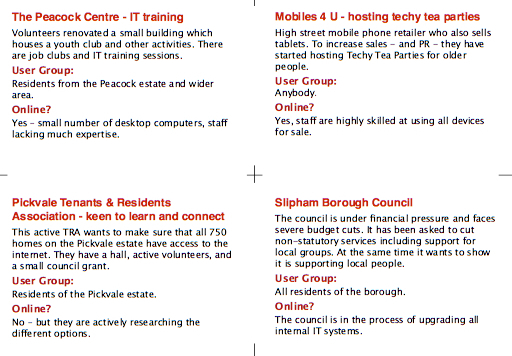 We are following a similar approach to other games we have run, first developed some 15 years ago to help groups decide how they might wish to use computers in community learning centres. These days learning can be more personal, mobile and appified. We’ll start by asking people, working in groups, to invent some fictitious characters: their situations, skills, confidence with technology and life challenges. They’ll then pass the profile to another group – and receive one themselves. The groups will have a deck of cards with ideas for online activities, and choose some appropriate ones for their character. After that they will consider what device might be most appropriate: a computer, tablet, smartphone, smart TV or maybe a games console. The final stage will involve thinking about what sort of support might be needed: formal training, informal social sessions, help from a tutor, or friends and family, for example. The results of the discussion will be shared with policy makers and funders attending the second half of the event. That should lead to follow-on discussion about who can do what to help. During our exploration for Nominet Trust, Geraldine Bedell ran a discussion on Gransnet which gave some terrific insights into what may be useful or not, and I’m expecting a lively discussion this time around too. If you any further ideas – or want to suggest changes – please do so on the doc, or in comments here. I would also be really interested in thoughts on which device may be most appropriate for which activity. I’ll follow on with a further blog post about that. I think that you can do many of the above activities without a computer, and that for a lot of people a tablet is preferable unless you need to do office work. If that’s the case, the challenge for organisations who wish to support people in adopting digital technology is that they may need to do some learning themselves. Gransnet forum Worries about later life – and are there solutions in technology? I’ve now posted all the content from the Nominet Trust exploration into digital technology for later in life to a new site, and I’ll be looking for opportunities to suggest its wider relevance. Here’s one. A report from the Shaping our Age project, featured in today’s Guardian, concludes Older people don’t want to be passive recipients – they want to get involved – which resonates strongly with the Ten pillars of wisdom manifesto I helped developed recently with Tony Watts and Bryan Manning. The main route older people see to improving their wellbeing is social contact and the route to this was having a say and involvement. But this doesn’t mean getting sucked into committees, procedures and bureaucracy, the stuff of old-style engagement. Instead they want to be asked what they want, supported to widen their horizons, recognised as having a lifetime of skills and experience, offered opportunities to meet other people – of all ages – and supported to do the things they like to do. What’s needed now are the 21st-century equivalent of the old “Darby and Joan” clubs, to reconnect older people – not just more of the same. And, critically, older people themselves must be centrally involved in formulating what this will look like. With our dramatically changing demographics, policies must now catch up and move from “doing to”, to being “involvement-led” for this increasingly important minority in our society. There’s the promise in the article of a fuller report Involving Older Age, the route to 21st century wellbeing and it will be interesting to see if they have any suggestion about how digital technology can help with involvement and independent living. There’s quite a bit in our digital technology for later life work, and certainly in that by Shirley Ayres, which we referenced here. Gransnet local is doing just this, enabling meet-ups and online forums so that we can socialise as persons in our own right without having to “do” some activity deemed good for us by some third party. Only recently launched there are already new bonds and relationships being made, there is a lovely thread on the Middlesbrough forum which sums it all up. 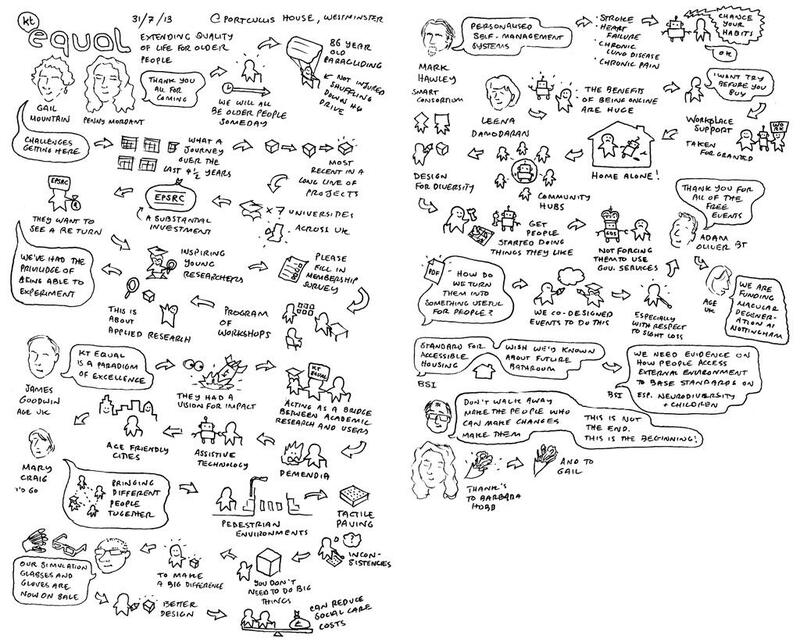 The thread is brilliant, and another example of the great conversation space developed by Gransnet. One of the highlights of our exploration was the Gransnet discussion about technology facilitated and summarised by Geraldine Bedell. The original forum discussion here. What’s slightly disturbing is that I haven’t heard the Shaping our Age report mentioned by others that I’ve been working with in the field … which may just be another example of the problems of knowledge sharing that we – and Shirley Ayres – have highlighted. Theme 4: Better sharing of knowledge, experience and resources could foster innovation. The provision of information that is relevant, brief, up-to-date, jargon free and accessible. Many participants involved with Shaping our Age questioned the use of technology to meet the information requirements of all older people. This participant argued for more face-to-face contact to tailor information to the preferences of individuals. Older people like face-to-face contact because they haven’t grown up with technology like this generation. Information providers also need to take into account the particular communication needs of groups such as older people from black and minority ethnic communities, those with sensory impairments or who for other reasons communicate differently or non-verbally. Which is fair enough, and perhaps opens the door to a conversation about how appropriate tech can be helpful. It is important, as John Popham highlights in promoting his important event for social housing providers, which I reported here, government plans to put all services online means there’s no escaping tech if you wish to claim benefits, for example. Enable carers and care services – both for direct use of technology and to act as proxies. There’s lots of research, programmes and even innovation funding to address the challenges of later life, as our team of socialreporters detailed in a recent exploration for Nominet Trust **. However, most of this is about doing things FOR older people. What would it be like to switch the professional emphasis towards doing things WITH older people? I spent yesterday in Bristol at the SW Seniors Assembly getting some ideas, and I’m quite sure I’ll pick up more from a NESTA event with Vickie Cammack this evening. I’m nearby and so can attend, but it is also being live streamed from 6pm. 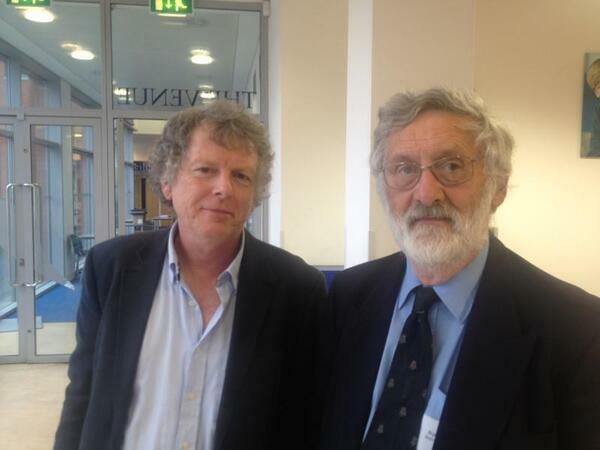 Meanwhile I can’t resist sharing some thoughts I developed from the assembly discussions, and then bounced off Tony Watts, who is chair of the SW forum on ageing, and Bryan Manning, visiting professor of compunetics at the University of Westminster. We turned my 10 provocations into a draft manifesto, and Tony suggested Ten pillars of wisdom, which I like, since it reflects a lot of the discussion around the wisdom held by older people, but perhaps not sufficiently valued by the “ageing industry”. Point 4. The manifesto reflects some of the 10 propositions generated by the Nominet Trust work, but this time without so much of an emphasis on technology. Enable older people to do as much as possible for themselves. We can’t afford to do otherwise. De-professionalise the communication of ideas, options and policies around ageing so that everyone can engage in the conversation. Apply good design to simplify technology that will benefit everyone. Codesign with users. Respect and use the wisdom of older people. They are the only people who know what it is like to be old. Develop communities and networks with older people for influence and learning. Recognise that ageing affects people differently, and that only by understanding the diversity of barriers faced can we develop the choices needed to enable people to live the lives they want. Switch the digital inclusion framework from “how do we get more people online” to “how do we encourage and enable people to use whatever technology meets their needs and preferences”. Question whether it is really useful to teach older people how to use traditional computers. Tablets, smartphones or smart TVs may be easier and offer what’s needed. Switch funding from research and “good practice” about ageing into supporting action led by older people, and sharing knowledge through social learning. Recognise that a connected society is a healthier and more harmonious society, and that ageing is a challenge suffered individually, but best addressed socially. Here’s an interview with Tony and Bryan. It is also available on Audioboo here with a couple more from the assembly. What do you think of the manifesto? I’ll be developing a more rigorous framework with Tony, Bryan and others, and also developing ideas on how to put some of this into practice, building on the work we did for Nominet Trust on technology in later life. Now off to NESTA. ** Update: All content from the Nominet Trust exploration is now available on this site – Digital technology for a better later life.